i love the tradition of solstice pajamas, but this year we really needed pillows. 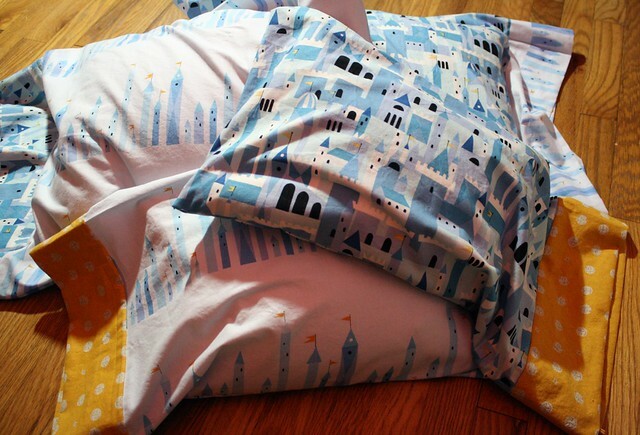 long, long ago, i saw tara mention that she had gotten a toddler pillow for her daughter on etsy. i knew we wanted non-foam pillows, and i found these amazing handmade pillows filled with buckwheat hulls. (totally brilliant - including a zipper to remove hulls for comfort/washing.) when grammy asked what was on our list, i asked for these, pretty please. when papa asked what was on my list, i asked for a solo date to the fabric store. i was also inspired by lisa's daughter kayla and her pillowcase making. (she made it look so easy! i actually found these instructions very helpful.) these will be a solstice eve gift for all of us, and i hope more pillow case making is in my future. maybe even pajamas. if you are feeling the handmade holiday crunch, don't forget to rely on other makers out there!